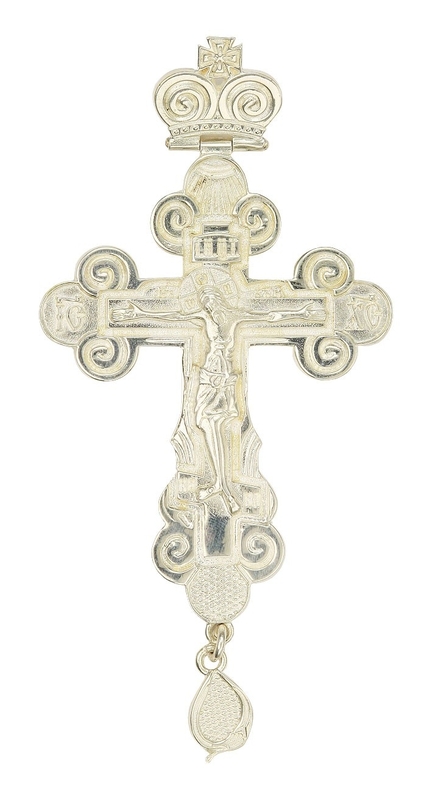 Pectoral cross - A188L - Istok Church Supplies Corp.
Pectoral cross is made of brass and covered with high quality silver plating, galvanized. Such application technology guarantees an invariable appearance of the product for a very long time and ease of maintenance. The cross is small in size, without stone inserts, so it can be used as a variant of the office cross. In such a cross, it will be very convenient to perform various tasks. The crucifixion is an applique one, three-dimensional. The product is packed in a presentable man-made leather packaging with a velvet lodgment.